Brand-new neighborhoods are popping up all around Brooklyn, in areas we know but with names we’ve never heard of before. No, I’m not talking about the controversial practice by developers of re-naming border areas between neighborhoods in an effort to evade a neighborhood’s “sketchy” past (for example, Bushwick between Flushing and Dekalb avenues renamed East Williamsburg or Bed-Stuy west of Nostrand Ave rebirth as Bedford-Hill). What I’m referring to is the full-scale carving out of an area within a neighborhood by luxury developers and renaming the area something altogether new. The comments that followed echoed his dismay. But is this really a case of cocky developers invading Brooklyn or can this be viewed as, well… nothing new at all? NYC real estate giant Forest City Ratner Companies owns the property, and for their part, what the area is about to gain is a lot more than it loses in a name: That includes 6,000 more apartments (one-third of them affordable), multiple retail spaces, eight acres of parkland, schools, playgrounds, parking, food courts, office spaces– basically an all-inclusive, self-contained village that blends home, work and play. Think: Battery Park City in Lower Manhattan or LeFrak City in Queens, both similar-type neighborhood complexes christened with new names and wholly accepted as such. “Density ought to be embraced, and vertical living ought to be celebrated,” said MaryAnne Gilmartin, president of Forest City Ratner Companies in a New York Post article. So is it really such a big deal? “All of a sudden, Prospect Heights isn’t good enough?” remarked another commenter on the Facebook thread. Well, whatever side of the argument you fall on, one thing is for sure in Central Brooklyn: There goes another neighborhood. Love this story. The neighborhood folks fought against the entire project years ago. The use of eminent domain was misused. Now Pacific Park comes looming up. We knew the hi rise, park & other amenities were part of the plan but to find two years ago it would be an enclave within an enclave–Prospect Heights is the western end of Crown Hts–is too much. Prospect Heights residents are right: why isn’t “Prospect Heights” good enough? When do we reign in all these isms schisms? Please. Battery Park City is 92 acres landfill from the World Trade Center excavation. They can legitimately claim to be a new neighborhood. It’s more than four times the size, in acres, of Atlantic Yards/Pacific Park. It’s a complex or development project, not a neighborhood. Even if it were, it’s nearly twice the size of Atlantic Yards/Pacific Park. 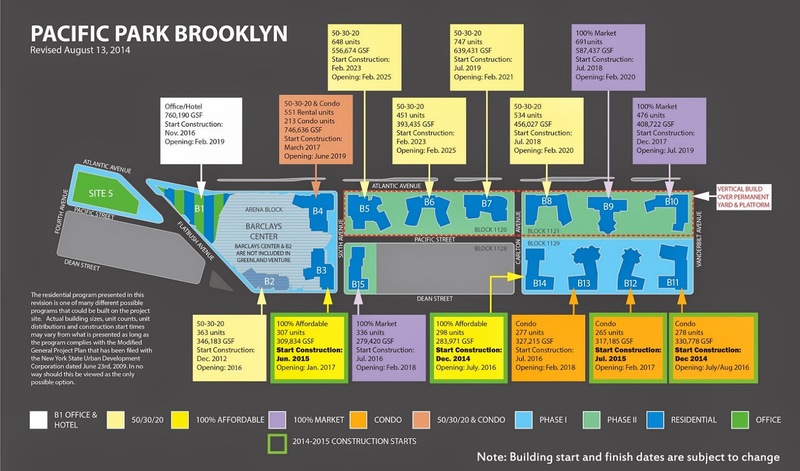 Atlantic Yards/Pacific Park is a 22-acre site, some pieces acquired via eminent domain and the threat thereof, other pieces (P.C. Richard/Modell’s and most of the railyard) still not owned by the developer. Flatbush Avenue cuts through the site at the west end, separating that P.C. Richard/Modell’s plot (aka Site 5) from the block containing the Barclays Center. The “neighborhood” includes one 100-foot-wide development site just east of Sixth Avenue between Dean and Pacific streets (B15), but not the rest of that block. Does that look like a “neighborhood”? Or is it just a developer’s branding? In ten years greed will make Brooklyn unrecognizable! Don’t forget Stuyvesant Heights who has distanced itself from Bed-Stuy proper. Using a long suffering narrative, (you know how bad it was back then) they reap the full benefits of our tax dollars while the rest of Bed Stuy can’t even get a decent garbage receptor or a tree planted. In fact, I don’t think the elected reps of whatever is (Bed-Stuy or Stuy Heights) even set foot on the other Bed-Stuy .